(RIA Novosti – MOSCOW, September 22, 2013) ­ Vladimir Putin’s spokesman has categorically dismissed online rumors that the Russian president has remarried in a church ceremony at a secluded monastery in central Russia. A Twitter message that swept through social networks on Saturday claimed that Putin, who divorced in June, tied the knot again earlier in the day at the Iversky monastery in the Novgorod region while the area was cordoned off by security personnel and police. 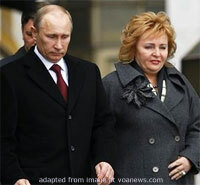 Putin and his wife, Lyudmila, announced on June 6 on nationwide television that their marriage is over. Both Putins said the reason for their split was the president’s work, which consumes most of his time and requires a very public lifestyle. The announcement put an end to years of speculation about the strength of the Putins’ marriage, fueled by the first lady’s increasingly rare appearances in public over the past five years.